The skin tightening treatment works by strengthening existing collagen fibers in the skin. Often time, these fibers have been weakened over time due to aging and stress, leading to saggy skin. The laser skin tightening procedure uses Bi-polar RF energy to heat the skin and stimulates collagen synthesis between the cells, to strengthen existing collagen fibers to improve the texture. The procedure provides immediate results as the contraction of tissue fibers results in a smoother appearance of the skin. Th collagen fibers are also strengthened by the laser in order to ensure permanent skin tightening effects. What can I expect from laser skin tightening? The treatment is proven effective with zero side effects, and includes a unique mechanism for cool down with cooling gel. For optimal results, Dr. Russell recommends three to five treatments, that last approximately 30 minutes each. Skin tightening laser treatments are available for all facial areas. This includes the jowls, cheeks, brows and the sensitive zones of the eyes and forehead, as well as the neck, décolleté and underarms. There are two types of skin tightening. ReFit is the best solution for body skin tightening. In order to tightening and strengthen the collagen fibers in lower dermal areas, FbeReFit uses safe levels of RF energy to shrink and elastin the fibers, restoring your skin’s elasticity. ReFit is easy and painless, providing immediate long term results. See before and after pictures below. ReLift treats the lower face and neck by reducing fat volume in the cheeks and chin areas. 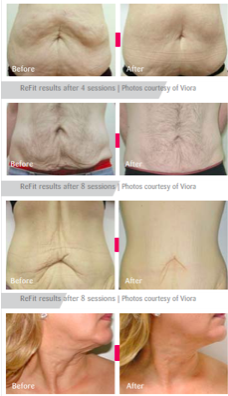 By using advanced Viora Laser technology to stimulate natural lipolysis to shrink fat cell volume, this treatment allows for a more prominent, defined, smooth jaw line and neck area. ReLift treatments are performed by Reaction™, the leading contouring and skin tightening RF device. There is no anesthesia involved in this treatment, no downtime, and is easy and painless. Watch the amazing effects of our Skin Tightening treatment in this video. "Spends time and listens to me!" "Efficient, Friendly Staff. She listens to me." "Found melanoma on my arm and saved my life!" "Had the privilege of being a patient. Won't find a better doctor"
"Dr. Russell was very thorough. She spent time listening to me." "Dr. Russell has the best bedside manner of any dr. I have been to, and I have seen many"
"Give her a chance. She will listen to you and really try to help you." Grand Lake Primary Care is a state-of-the-art, 4,200-square-foot medical facility. With nine exam rooms, a procedure room, and a separate Medical Spa for aesthetic and cosmetic procedures, Dr. Russell created the facility with her patients’ varying needs in mind. From in-office cosmetic procedures to family medicine, the providers are continuously learning from nationwide training courses and best practices to improve on and expand the services they offer. Recently, Grand Lake Primary Care has added a variety of laser services to the medical spa portion of her practice and is now offering the latest in laser treatments to their patients. The services include non-invasive body contouring, cellulite treatment, laser skin tightening, and laser skin rejuvenation. We specialize in all Family Medicine and Medical Spa services. Please contact our office for more information about the insurances we provide. "Her compassion for our daughter was amazing and she was very knowledgeable. She even called us at home after being discharged to check on our daughter"
"I hate going to the doctors office, it makes me nervous and I'm not sure why, however her office staff was so caring and sweet they made me comfortable very quickly"
"It's rare to find a doctor that cares. Her staff is extremely helpful and her nurse helped me get a medication that was going to be extremely expensive." "I have never been in an medical office that is so professional and courteous. The in house lab is so convenient and the staff is incredible. Highly recommended." "Dr. Russell is the only doctor in the last 15 years that cared to get me on the right medicine and off my beta blocker. I have never felt better!" "I give her an A+++++ because I wasn't hurried in and out like my last doctor and she listened to my concerns and acted on them." "I’ve seen most of the doctors in Grove looking for kindness, true caring, knowledge, and time for me! Until I found Dr. Russell, my needs weren’t met." "Dr. Renee and her staff have gone out of their way to welcome me as a new patient"